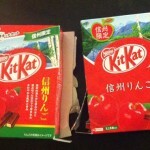 Review: Shinshu Limited Apple Kit Kat | Oyatsu Break! 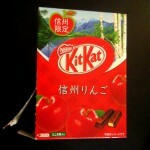 Another of the regional varieties of Kit Kat that are now around more-or-less all year, Shinshu Apple Kit Kat comes from the Nagano region (Shinshu is an old name for Nagano), and Nagano is famous for its apples. 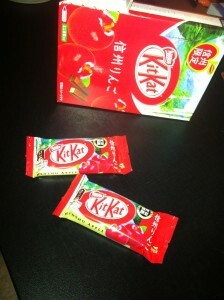 It all comes together in the form of a delicious Kit Kat, available regionally or at the food importer at Narita Airport. 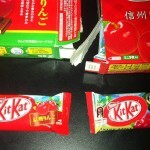 :) I’ve generally enjoyed the fruit Kit Kats like Yubari Melon, and I was expecting to just love the Shinshu Apple. How did they fare? Read on! The package is lovely, with a light gingham pattern in the open spaces to add texture, large photos/illustrations of apples, and a picture of the milk chocolate wafer bars you’re going to find within. The bar packaging is nice as well, interestingly enough it has a bunch of ENglish writing that you won’t find anywhere on the exterior! 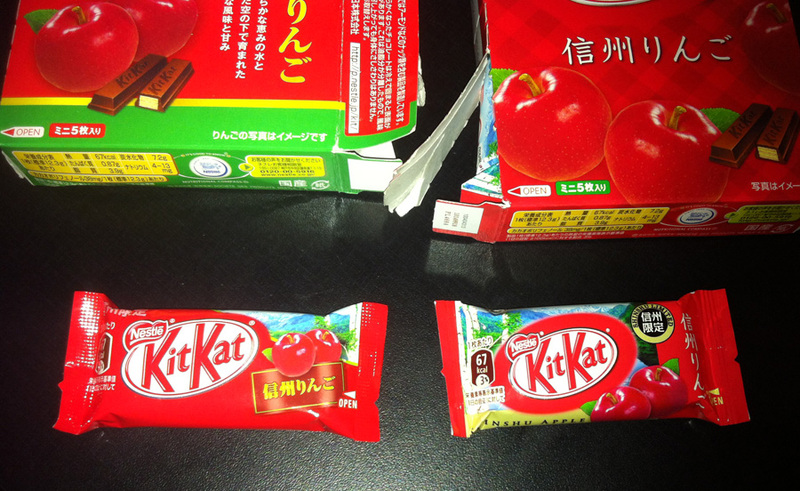 A small seal proclaims “Shinshu Limited” and the bottom of the package features “SHINSHU APPLE” written in smallcaps (ooo!) English. 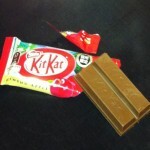 This might be the perfect Kit Kat mini packaging for my money…! 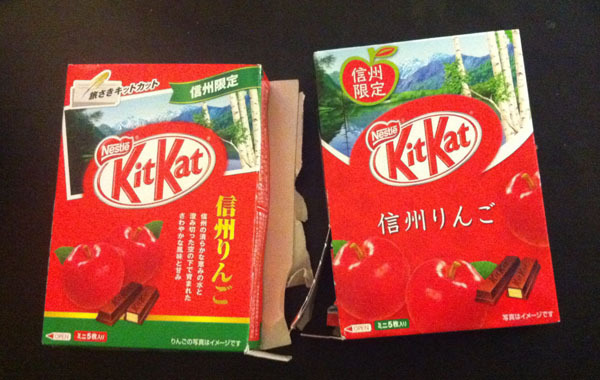 Interestingly enough, I still had a small box of Shinshu Apple Kit Kats left from my last trip to Japan in 2010, and so I thought I’d show you some side-by-side photos of last year’s model and this year’s! 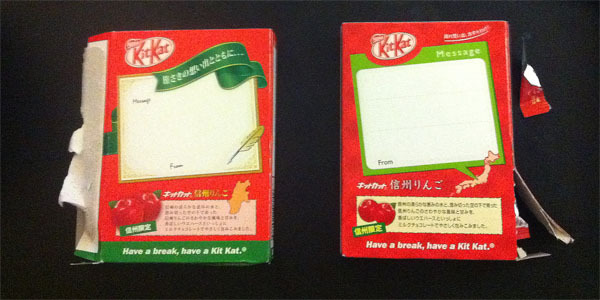 On the left you can see the 2010 edition, which has much more of a postcard feeling, tons of writing on the front, and a more staid design over all. The 2011 update is really sharp and pretty, even though it’s using all of the same art. 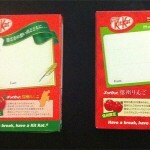 The improved design continues to the back, in my opinion. The 2010 version is all kinds of ornate (a quill!) which is quaint and charming, but the clean and minimal design of the writing area is a little nicer on the 2011 version. 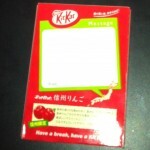 2011 also features the location of this regional Kit Kat using a map of the entire country of Japan and a pointer, rather than just the arbitrary outline of Nagano prefecture entirely removed from any context. Definite improvement! 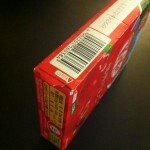 The packages are also very different. As I mentioned I applaud the English on the new package, and it is lovely as a design, but the minimalist version of the 2010 design is appealing too. 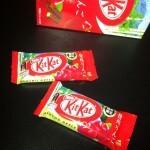 Scent: This was a great Kit Kat, with sweet apple flavour wafting up as soon as I opened the package. It’s a very sweet apple smell, but very close to a real one which is neat. 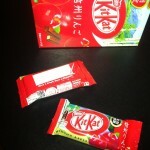 There are small hints of the milk chocolate, but for the most part it’s a really bright apple scent, without being too candied or artificial. Nice! 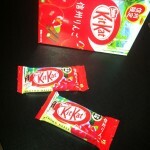 Taste: I have to admit that I cheated, reading a few reviews of this Kit Kat before I wrote my own. While both of the reviews I read were pretty disappointed with the ‘mild’ apple taste of these bars, I found them to really hit a nice middle ground between some of the cloying, over-the-top white-chocolate based flavours and the ‘boring’ milk chocolate flavours. These have a really nice apple flavour, definitely accentuated by the strong scent, and I feel like it’s a really nice mix of apple and milk chocolate. Verdict: Again, it’s going to come down to how much you like fruit and chocolate together–my husband just out and out refused to try this one due to fruit/chocolate hatred–but I thought it was really nice and bright. I could see how the taste would be stronger, but I don’t think I’d describe it as subtle. Wasabi is subtle. This is just a tasty Kit Kat and I’d definitely recommend it!